Create a contemporary look you've wanted in your home with this stunning sofa, which will enhance your living space with a fresh style. Clipped rolled arms, a curvy pillow back, and matching pillows will establish a cosmopolitan appearance, while maintaining a friendly, cozy appeal. 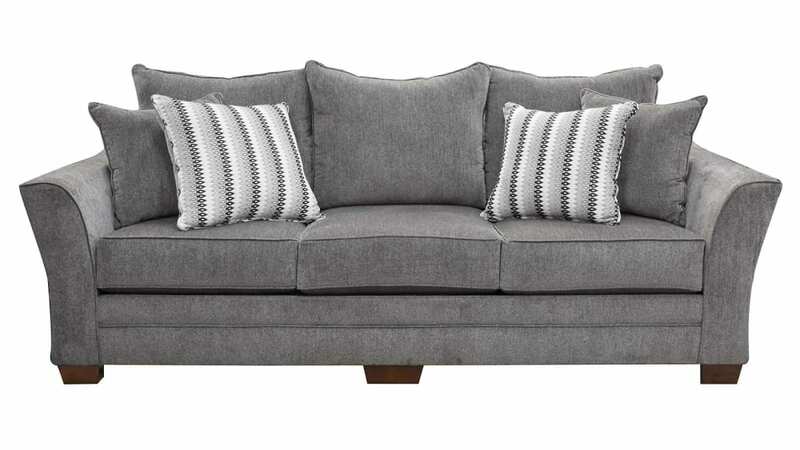 You'll love this distinctive sofa, and your guests will admire your taste. Proudly Made in America for excellent quality! Contemporary styling will keep your home looking beautiful. Resilient and dense, Dacron-wrapped foam cushion cores will provide years of stylish comfort. A heavy and well-made frame will stand up to the stresses of family life, children, and daily living. Slightly tapered block feet add to the cosmopolitan style. Beautifully designed accent pillows perfectly complement the cultivated aesthetic.